Welcome to our website. 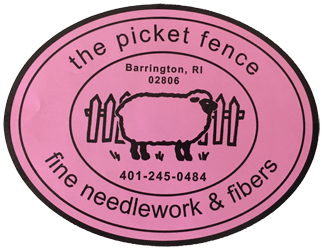 The Picket Fence has been in business for over 40 years and offers a large selection of hand painted canvases, threads and needlepoint accessories in our area. We have access to many outstanding finishers that will transform your piece into a pillow, an ornament, a flat back hanging piece or a framed piece. The finishing ideas are endless. We have a custom artist that can paint whatever is dear to you, such as a belt that tells a story, your favorite pet, a college emblem, your home or summer home, paint a custom name on a Christmas stocking and so much more. We have great relationships with all the top designers and can order any piece you are interested in. We have a very friendly and knowledgeable staff that will help you with all your needs from helping you choose your fibers and any stich they think will work and make your piece fun. We offer private lessons for beginners or if you want to learn a new stitch. We have mini workshops that will be posted under our Classes tab. We have Trunk Shows from our fabulous designers every month and offer a discount on all the canvases that come in and you can see the date and artist under our Trunk Show tab. Any canvas you see on our site from a designer, we can ship with or without the threads anywhere in the country. You can ship your finished pieces and we can have them done as well and will ship them back to you. Linda Harrison the owner of this wonderful store, has so much passion for needle point and puts her heart and soul into all her customers needs. Her eye for color is just remarkable and so many of her customers let her decide on what colors to choose and how it should be finished. That is very special in this business and she should be proud. Please enjoy our web site and stop by to see us when you are in the area. Happy Stitching!